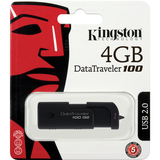 DataTraveler 100 Generation 2 (G2) is a stylish black drive that goes anywhere. Affordable and convenient, it lets you share, store and retrieve data in a flash. Carry all of your documents with you, wherever you go.